In large bowl whisk together sugar, flour, salt and baking soda, set aside. 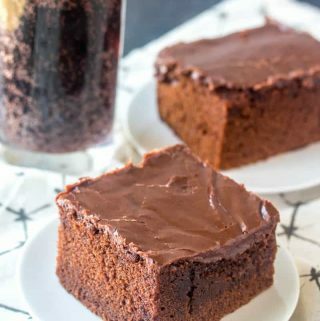 In saucepan over medium heat whisk together your Coca Cola, oil, butter and cocoa powder and whisk until smooth and bring to a boil, pour oven flour/sugar mixture. Beat with hand mixer until combined. Add in eggs, buttermilk and vanilla and beat again until smooth. Pour into prepared pan and bake for 35-30 minutes until center is set. Remove from oven and poke holes all over the top of cake with small wooden dowel or with a fork. To make frosting in sauce pan melt together butter, cocoa powder and milk. Bring to a gently boil. Remove from heat and immediately whisk in powdered sugar and vanilla until smooth. Pour over warm cake and gently press down into holes. Let cool for about 30 minutes to give frosting time to set up.